In this “Kitchen Spotlight” post, we’ll take a snapshot look at an all-time American (and likely around the world in other countries) favorite: apples. Apples are a good source of soluble and insoluble fiber and contain phytochemicals (an example would be flavonoids such as quercetin). Carbohydrates are the main macronutrient, but apples also contain quite an array of micronutrients such as vitamin C, B vitamins, vitamin A and E, calcium, iron, potassium, zinc and fatty acids – though all in very minute amounts. A general comparison of the nutrient profile of a medium apple with and without skin on shows that an apple with skin has roughly 2 grams more fiber than the alternative, and packs just a little bit more of certain nutrients such as vitamins A, E, and K. However, choose your apples carefully. 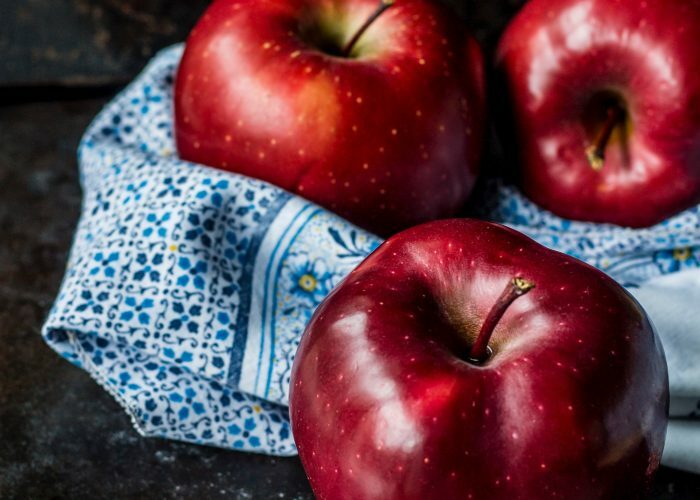 Due to high pesticide levels found in U. S. grown apples, it is best to go with New Zealand grown apples and/or organic varieties where possible. ConsumerReports has found that while washing apples well in water will help reduce some of the surface pesticide residues, peeling may not be as effective as most think in reducing pesticide load (see source citation below for more information). So the next time you pick up an apple, take a moment to think about where it’s from, and how you’ll use it in the kitchen! Broihier K. Apples. Food & Nutrition Magazine, Fall 2012 Edition. ← What’s in a Sweet Potato Leaf?